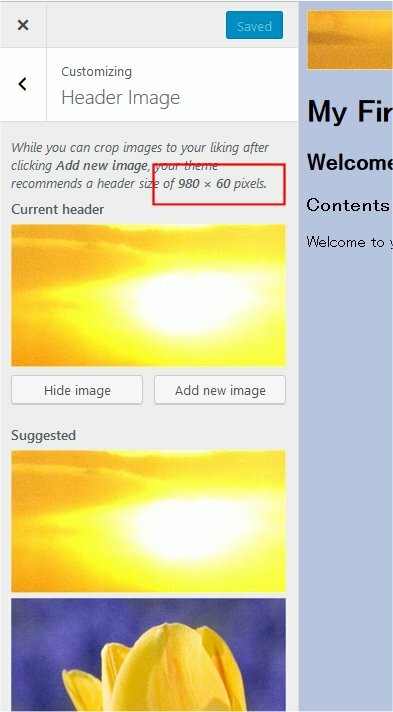 Custom headers allow site owners to upload their own “title” image to their site, which can be placed at the top of certain pages. These can be customized and cropped by the user through a visual editor in the Appearance > Header section of the admin panel. You may also place text beneath or on top of the header. To support fluid layouts and responsive design, these headers may also be flexible. Headers are placed into a theme using get_custom_header(), but they must first be added to your functions.php file using add_theme_support(). Custom headers are optional. The after_setup_theme hook is used so that custom headers are registered after the theme is loaded. What are Custom Headers? #What are Custom Headers? When you enable Custom Headers in your theme, users can change their header image using the WordPress theme Customizer. This gives users more control and flexibility over the look of their site. When enabling Custom Headers, you can configure several other options by passing along arguments to the add_theme_support() function. If flex-height or flex-width are not included in the array, height and width will be fixed sizes. If flex-height and flex-width are included, height and width will be used as suggested dimensions instead. By default, the user will have the option of whether or not to display header text over the image. There is no option to force the header text on the user, but if you want to remove the header text completely, you can set ‘header-text’ to ‘false’ in the arguments. This will remove the header text and the option to toggle it. When the user first installs your theme, you can include a default header that will be selected before they choose their own header. This allows users to set up your theme more quickly and use your default image until they’re ready to upload their own. Do not forget to call register_default_headers() to register a default image. In this example, sunset.jpg is the default image and flower.jpg is an alternative selection in Customizer. From Administration Screen, Click Appearance > Header to display Header Image menu in Customizer. Notice that width and height specified in add_theme_support() is displayed as recommended size, and flower.jpg is shown as selectable option. By default, the user will have to crop any images they upload to fit in the width and height you specify. However, you can let users upload images of any height and width by specifying ‘flex-width’ and ‘flex-height’ as true. This will let the user skip the cropping step when they upload a new photo. To display the custom header, function get_header_image() retrives the header image. get_custom_header() gets the custom header data. E.g. below shows how custom header images can be used to display the header in the theme. The below code goes into header.php file. header_image() Display header image URL. get_header_image() Retrieve header image for custom header. get_custom_header() Get the header image data. get_random_header_image() Retrieve header image for custom header. add_theme_support() Registers theme support for a given feature. register_default_headers() Registers a selection of default headers to be displayed by the Customizer.